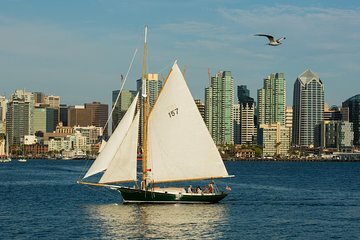 See San Diego on a small-group 2.5-hour cruise aboard a classic 32-foot (10-meter) sailboat. Munch on light snacks, accompanied by craft beer or wine, while taking in landmarks like the Maritime Museum and USS Midway, in addition to wildlife and the bustling San Diego Harbor. Make your own way to the Sunset Resort Marina to board the Liberty sailboat, a replica of a 1914 Friendship Sloop. Your vessel features details including a wooden mast and gaff-rigging, and your captain only employs traditional sailing techniques. Get close views of landmarks including the Coronado Bridge, Maritime Museum, the San Diego skyline, and the Old Point Loma Lighthouse. Keep an eye out for sea lions and dolphins, and grand ships such as the Star of India, the USS Midway, and the USS Carl Vinson. Your crew provides craft beer, white wine, soda, water and light snacks during the 2.5-hour cruise. If you would like to learn some sailing techniques, participation is encouraged.